The Very Best Gluten Free Recipes, 2014 edition | Great gluten free recipes for every occasion. FIRST THINGS FIRST: Thank you, friends! We’ve come to the end of another gluten free year together. I love a fresh start, and as we stand on the edge of 2015, it’s fun to look back at the year we’ve had. I’m calling these the best gluten free recipes of 2014, since they’re the most trafficked recipes and pages here on the blog. Although there is some room for debate about whether popular means “best,” when it comes to a food blog, I think they’re kind of one and the same. Some of you are brand new to this site, and some of you have been with me for years. I know many of you by name (whether you realize it or not! ), and I cherish your patronage. Whether you skip straight to the recipe, or read my blah blah blah in each entry first, whether you check in every day or just once a week—I welcome and appreciate you. Looking Ahead: In 2015, you should have my 4th cookbook, Gluten Free Classic Snacks, in hand in late March if you preorder. On October 1, I’ll turn in the manuscript for my 5th cookbook (!). Before any of that, though, in January this site will be redesigned to be even more photo-driven, with an option to view it in traditional blog format or a more editorial style, a brand new Recipe Request Submission process (I love your recipe requests! ), and many other little features that will make the site faster and easier to use. Plus, the blog design is going to be “responsive,” which means that it will be way way WAY easier to read on a mobile device or tablet, which is where most of you read it. More details on that soon! Best 14 in 2014: Below are the recipes and the pages on the blog that were the most-loved this year. As always, some of them surprised me, and some didn’t. Just as in previous years, I learn from what you love, and what you don’t. This blog is a partnership, and I value your (polite!) feedback. So let’s settle in and look back at 2014, A Year To Remember. LOVE YOU! 1. Old Fashioned Gluten Free Cornbread: This is, far and away, the most trafficked recipe on the whole blog. It is adapted from Old Fashioned Cornbread in my first cookbook, and was first posted on the blog way back in 2009. I later updated the photos on the blog, and turned it into a skillet cornbread, but whatever I do with it—you love it! And you know what? So do I. It has one type of flour—coarsely-ground yellow cornmeal—is quick, easy and absolutely delicious. 2. Gluten Free Instant Noodle Cups: This was a later-in-the-year addition to the site, but it quickly became popular and is on pace to blow away every other recipe on the site in the coming year. It’s super simple, and just as useful as it’s so adaptable. And who doesn’t need a super quick lunch or dinner on hand? Pinterest also really, really loves this recipe (and the action photo, too, I think), which helps a ton. 3. One Bowl Gluten Free Chocolate Cake: Again, simplicity wins the day. And a super rich chocolate cake doesn’t hurt, either. That—and the fact that I adapted this recipe into a decadent chocolate mousse cake, which links back to this recipe. This cake is a definite winner. 4. Gluten Free Fried Chicken, KFC-Style: It’s kind of a mess to deep fry, but it’s still totally worth it for these 11-herbs-and-spices pieces of fried chicken goodness. Lots of tips included in the recipe for how to make it work. My family ate a LOT of friend chicken when I was developing this recipe over a period of a few weeks! 5. Gluten Free Bread Recipe Index: With the release late last year of Gluten Free on a Shoestring Bakes Bread, there was a very big renewed interest in the index of gluten free bread recipes here on the blog in 2014. Having a visual recipe index was very important to me when I had the blog redesigned about 2 years ago, and when another blog redesign coming soon, it is going to be even more photo-driven. I think you’re going to love it! 6. Braided Gluten Free Nutella Bread: Making this braided Nutella bread is way, way easier than it looks, given how impressively gorgeous it is. Many of you realized that (and even posted photos of your beautiful breads for all of us to see on Facebook, which I love), and, well, I kind of think you bragged to your friends. 7. Gluten Free All Recipe Index: Like the visual bread recipe index above, the general recipe index is also something you spend a fair amount of time reviewing. I’m so, so glad, as I believe it’s the best way to get a bird’s eye view of what this blog has to offer. Can’t wait for the blog to become even more photo-driven in January! 8. Soft Gluten Free Tapioca Wraps: These simple wraps are just.so.useful. They are perfect for making ahead and reheating, and they even travel extremely well so they’re perfect for those gluten free lunchboxes. My kids would happily eat these for breakfast, lunch and dinner, and even my low-carb-loving brother and sister-in-law love them (and they can (and do!) eat gluten whenever they like). 9. Easy Gluten Free Biscuit Donuts: I know donuts, gluten free or otherwise, are not the best thing for us to eat. But the simplicity of these biscuit donuts (which will give you an easy taste of the cronut craze!) can’t be beat, and sometimes, you just want a donut. Like you “used to” have. 10. Gluten Free Flour Tortillas from GFOAS Bakes Bread: Like the soft tapioca wraps, these flour tortillas are incredibly useful. And like the tapioca wraps, they freeze and defrost amazingly well. 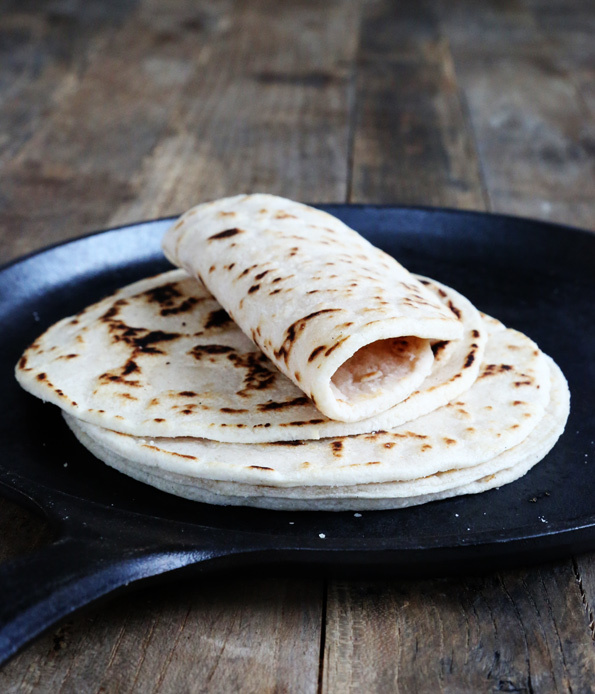 Plus, if you’ve never had a fresh flour tortilla right off the skillet with butter, you’re really really missing out. 11. Super Fudgy Paleo Brownies: Since Paleo recipes are big in January, we’ll be dipping our toes back in those waters here on the blog soon enough (I’ve already got a killer recipe for soft, bendable Paleo tortillas that I can’t wait to share with you). These dairy-free, grain-free, refined-sugar-free Paleo brownies are as lovely to sink your teeth into as you think. Paleo recipes can be great, and I love the new challenges of working with the different ingredients. 12. Glazed Gluten Free Donut Holes: You love this recipe because you know what I know: Dunkin Donuts Munchkins are delicious, and sometimes your gluten free kid just needs to know what they taste like. There’s one way to find out. 13. Gluten Free Bubble Pizza: I posted this recipe on the blog later in the year, and it was a quick, runaway success (and I think it will stay that way for a long time to come, with steady visitors all year long). It’s quick, it’s easy and you know everyone is going to love it. I always always always have some thick crust gluten free pizza dough in a bucket in my refrigerator, so a quick dinner of one sort or another is always minutes away. 14. Stuffed Gluten Free Soft Breadsticks: I bet you love these stuffed breadsticks for the same reason I do: sometimes (okay, often) you just need a fabulous portable meal that you can make for your kids to have in the back seat of the car in between sporting events, especially in the warmer months when it’s all sports, all the time. That, and they’re just plain fabulous. There’s that too! P.S. Were your copies of the Gluten Free on a Shoestring cookbooks under the tree? Or maybe the promise of a preorder of Gluten Free Classic Snacks?? Preorders should arrive in late March! Very exciting!! Just curious – has anyone tried making the cornbread into corn muffins? Or does the cornbread freeze without falling apart into a pile of crumbs? When I’m not on vacation this is my first stop after email each day! I love to see my favy,fav,favorite stuffed bread sticks on the list! Yum! Nicole, wishing you and the family a fantastic new year! I do love your story! You have come a long way from 2009, I recommend your blog and books all the time. I just joined the gluten free bandwagon a few weeks ago. I purchased your Bakes Bread book and CAN NOT WAIT for your newest book to be published. I have a request for 2015 please. More you tube videos. I watched all of them. You did great for your guest appearances at TV stations so there is no need to be silent while you film your personal you tube videos. Maybe have some neighbors or friends come over while you record so you feel like you are actually talking to someone if you otherwise don’t feel comfortable talking alone. I need to see at least 2 but preferably 3-4 videos before I feel comfortable doing something. The scrape and fold technique is something I need to perfect. I’m not comfortable with it after watching just one video. If you made additional videos showing how you make “Olive Garden” type breadsticks which started with the scrape and fold, then went into the shaping you would make me so happy. Additional food items that incorporate the scrape and fold, then different shaping techniques would also be so welcome. Happy New Year Nicole, Brian and kids! Nicole, look at all you have accomplished since 2009! And you’re working on a 5th book–happy, happy, joy, joy! I appreciate you so much and you know once I find out a person is gluten free, I tell them about you–even if they’re a stranger to me and I see them getting gluten free stuff in the supermarket! I am not shy at all! Like Anneke, even if you don’t here from me, I am here! My day isn’t complete unless I check the blog! Happy New Year, Nicole! Enjoyed all the great recipes of 2014 and am so looking forward to all the treats you have for us in 2015. Checking your blog is the way I start my day, so even if you don’t hear from me, you know I am here! Much love! You’re the best, Anneke!! Happy New Year to you and yours!